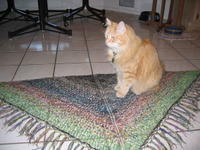 The first photo shows my Alpha Charlotte before blocking. This photo shows it after blocking, during an inspection by Tang. Since I have seen many questions regarding the Charlotte instructions on Knit U, I am going to describe a couple of worksheets that my fellow knitters use. Oneis a spreadsheet. It shows the number of each right side row, along with the total # of stitches for that row. It also shows how many stitches should be in the “growing” sections, and how many lace repeats on that row. You can also write in which of the 4 pattern rows (i.e. A, B, C, D) that particular row should be. The other page contains the written instructions. All you really need is the spreadsheet and the four row, 8 stitch repeat. That really is all you need to look at. Trust me! If you think these may be of help, by all means email me and I will be happy to forward them to you.